Colin Carter took this photo 'whilst climbing about in my early teens'! 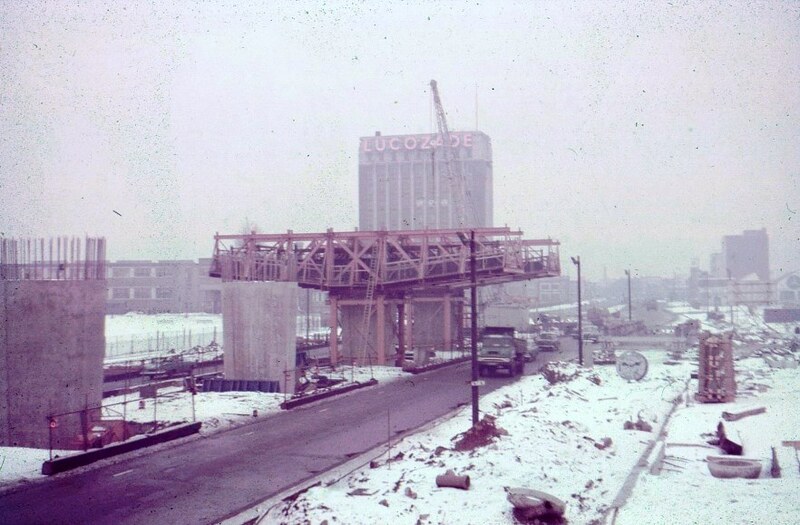 It was taken from the top of an unfinished pier by Carville hall park north and shows a wintry view of the construction of the M4 flyover around 1964. 'The Lucozade building was at the top of Clayponds lane opposite Clayponds avenue. The tower in my time has been BOAC, Beecham's; it is the one with the statue on the front and the much robbed Barclays bank at the bottom. The Lucozade bottling plant was on the oposite side of the road, with the famous filling bottle on that tower'. See more details about the G.W.R. including a photo of the original 'E' from Lucozade.